Times are changing. By 2020, millennials will make up half of the U.S. workforce and have a growing influence over organizational decisions, including technology purchases. This isn’t new news. 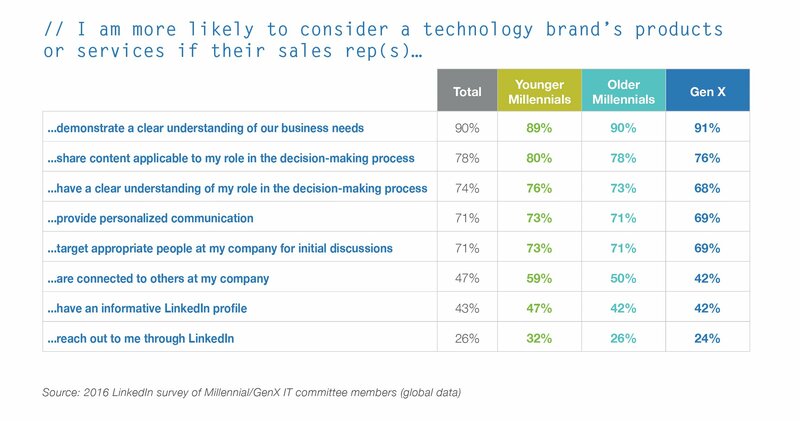 The increasing hype about the dominance of digitally-dependent millennials in the workplace when compared to their Gen-X counterparts begs the question: Are millennials really that different when it comes to influencing and making technology buying decisions for business? We were dying to know, and we set out to find the real truth. After surveying 5,470 global professionals on LinkedIn who either influenced, contributed to, owned budget for, made decisions about, or implemented one or more technology purchases for their company over the past year, we closely compared the responses of Younger Millennials (professionals age 19 to 25) to those of Older Millennials (professionals age 25 to 35) and Gen Xers (professionals age 36 to 50). Here’s what the hard data revealed. Millennials are gaining representation on the technology buying committee and holding decision-making power. But here’s where the truth ends and the hype begins: When it comes to the significant difference in what influences their technology purchasing decisions, the data shows that millennials and Gen Xers really aren’t that different after all. The buying committee continues to expand, with most encompassing at least four people and evenly distributed between millennial and Gen X cohorts. While millennials grew up more digitally connected than their Gen X counterparts, there’s little difference in tech savviness between the two, with three in four tech buyers in the “early majority” of tech adopters across generations. Both millennial and Gen X committee members are open to new brands and, when asked about their preferences for learning about new products and services, there was strong preference across the board for using social media (65 percent of younger millennials versus 59 percent for older millennials, and 56 percent of Gen Xers). 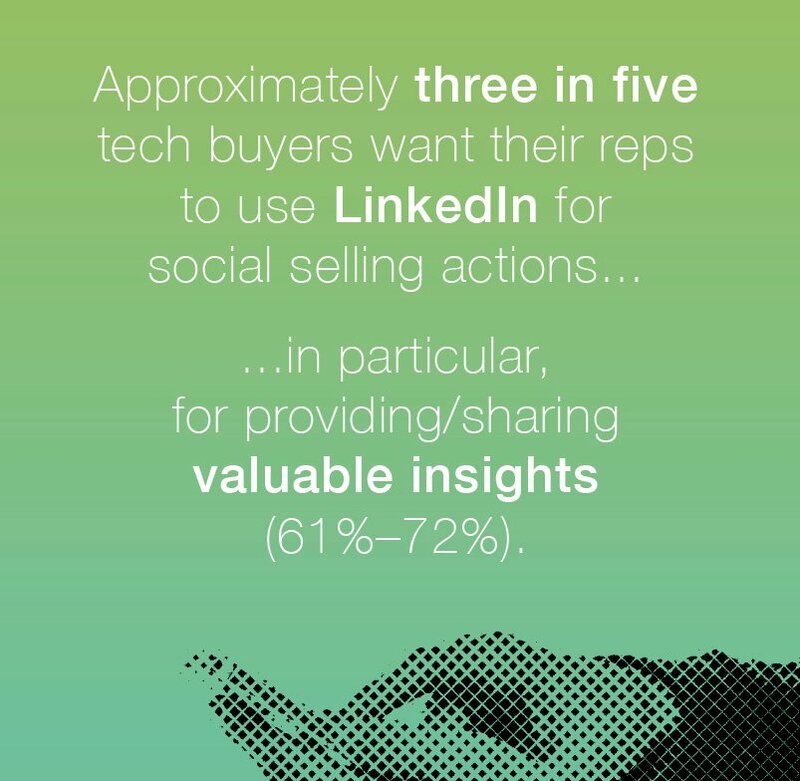 Personalized communication and insights-driven social selling behavior are critical for winning over all three groups, with younger millennials weighing the need for reps to thoughtfully address their business’ needs highest at 78 percent and 59 percent, respectively, versus 73 percent and 50 percent for older Millennials, and 68 percent and 42 percent for Gen Xers. More than three in five tech buyers encountered gated content online in 2016. Among these, 87 percent decided not to download due to gating. Millennials, especially younger ones, who encounter gated content are more likely to enter false information than Gen Xers. Privacy and relevancy were primary motivations. 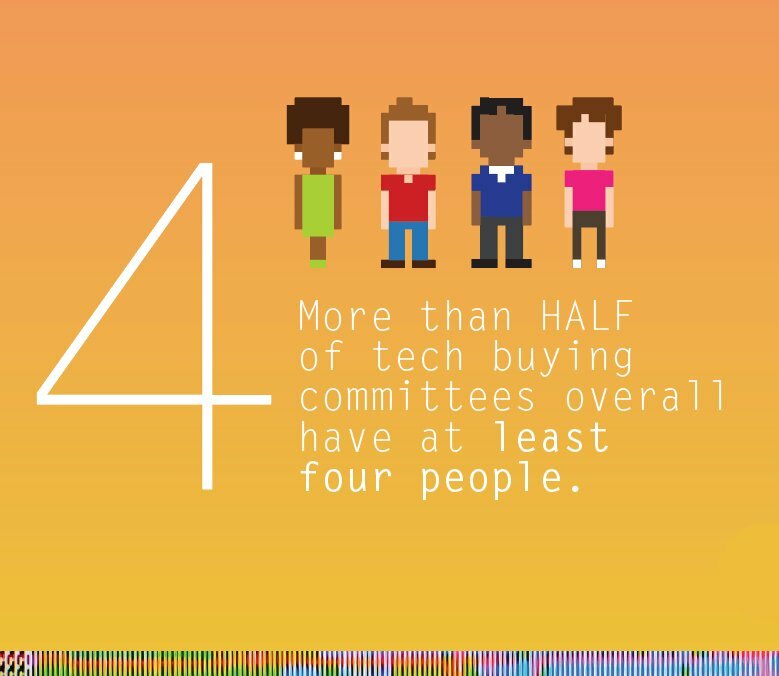 Last year, our research highlighted specific attributes of the many roles on the tech buying committee. This year, we examined their selling characteristics and content preferences more closely, paying particular attention to the millennial audience. We found that both front and back house functions (i.e., marketing, finance, business development, and IT) across all three cohorts provide feedback and have sway in vendor selection, implementation, and renewal. They also prefer sales reps who demonstrate a clear understanding of their businesses’ needs and provide relevant content. For example, whether a millennial or Gen Xer, different content formats are preferred depending on the particular input or decision stage. For implementation, learning guides (47 percent) are sought above all else, while opinions and reviews (40 percent) and product information (32 percent) come out on top during the budgeting process. When consuming information, tech buyers of all ages prefer short articles and posts that provide a mix of general news, expert opinions, learning guides, videos, and whitepapers along the purchase and post-purchase path. To put this into action, think strategically about what purpose each specific type of tactic serves in the technology vendor selection and purchase process. Note that social media’s dominance in sharing and distributing content will affect the way your buyers collect and use information during the buying cycle. Also, carefully consider the topic, what form it takes, and whether it should be gated or not. While there’s much ado about millennials, when it comes to technology purchases in the workplace, they have more in common with their Gen X counterparts than not. This is good news for marketers, especially as the buying committee continues to expand in size and complexity. By leveraging the common ground, marketers can craft and distribute content that is relevant and digestible regardless of generation. 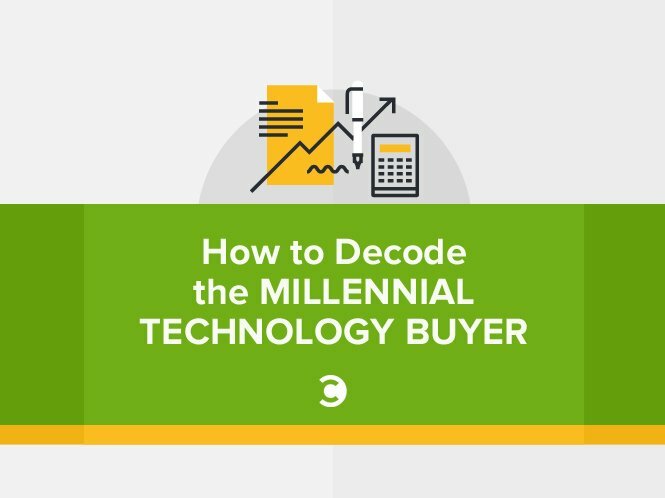 Separate the hype from the hard data when it comes to millennials and Gen X tech buyers. Check out the full ebook, The Future Tech Buying Committee: Millennials and GenX Decision-Makers Achieving MORE, Together. Kelly is the Global Director of Technology Vertical Marketing at LinkedIn Marketing Solutions.